It has been way too long since I have blogged. I still work full time as an auditor and my two little ones are as rambunctious as ever. I have chosen to put this little blog on the back burner, but it has not been forgotten. I still bake, not as frequently as I once did, but often none the less. These days I typically have an assistant or two helping out. I love cooking and baking with my kids and they love it just as much. My son declares on a daily basis that he is going to be a "cooker" when he grows up. When we go out to eat he asks to see the kitchen to watch the chefs cooking. My daughter on the other hand may just be assisting so she can taste test, but either way I love these precious moments with my kids. 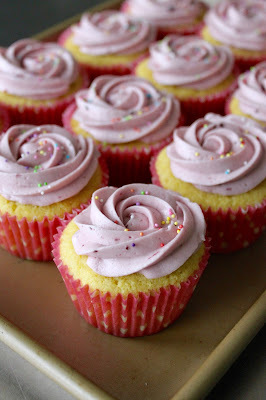 I made these cupcakes last week as my first attempt at Gluten Free baking. I assure you this is not going to turn into a gluten free blog, but I thought I would give it a whirl. These cupcakes were absolutely phenomenal! A neighbor of mine is complete gluten free and his response was "The cupcakes are AWESOME! 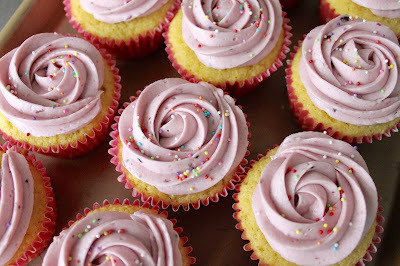 I'm not exaggerating when I say they have been the best GF cupcakes I remember having!" So even if you are not eating gluten free, you may want to give they a try. I used coconut flour in the recipe because I like coconut and it not foreign to me. Preheat the oven to 350°F. Line a 12-cup muffin pan with paper cupcake liners. Whisk egg whites until you have stiff peaks and set aside. In a separate bowl, beat together the butter, sugar, salt, almond extract, and egg yolks. Add the milk, and beat until smooth. In a separate bowl, sift together the coconut flour and baking powder. Add this mixture to the wet ingredients, and stir to combine. Gently fold egg whites into batter, folding in 1/3 of the egg whites at a time. Evenly divide the batter among the 12 liners, filling each 3/4 full. Bake the cupcakes on the center rack of the oven for 18 to 20 minutes, until a cake tester inserted into the center of one comes out clean. Remove the cupcakes from the oven, and let them cool in the pan for 5 minutes. Turn them out of the pan onto a rack to cool completely. Beat butter, salt, and vanilla until creamy. Mix in jam. Add powdered sugar 1 cup at a time, beating until combined. Add milk 1 tablespoon at a time until you reach desired consistency. It looks so cute! Nice to make it at home. I love cupcakes so much! Have to try this recipe tomorrow. Thank you! !